People typically rave about a restaurant with comments like, “I swear they had the best ribs I’ve ever tasted,” or perhaps,”the beef was so tender, I didn’t need a knife.” However, these are not the comments diners will say after eating at Le Chique, an adult’s only restaurant on the Azul Sensatori property in Riviera Maya, Mexico. That’s because the meal at Le Chique is an adventure in dining, a cutting-edge food fantasy like none other than I have tasted anywhere. My evening began with a peek into the busy kitchen where my foursome was served a foamy cucumber martini to cleanse our palates. Unusual but very tasty. 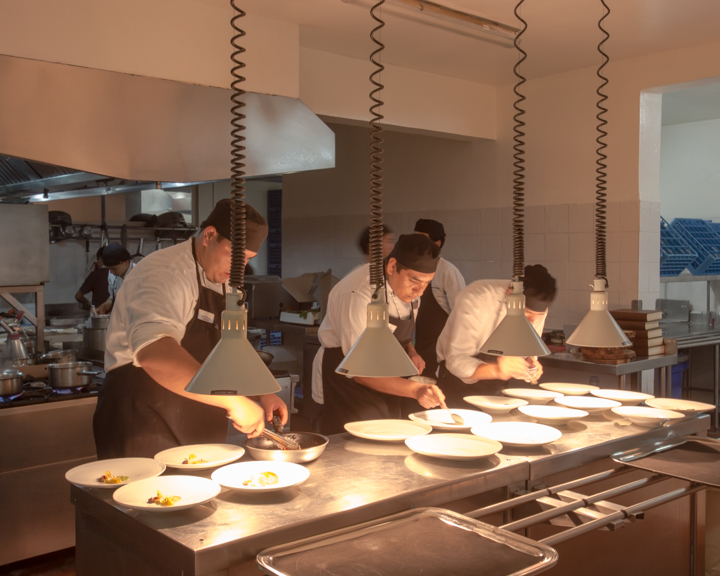 We watched the large staff of 28 scurry around preparing labor intensive plates for the meal. Then, we were seated at a round table in the dimly lit dining room and our service commenced. We were never at a loss for words but quite honestly I rarely had any idea what I was eating. wrapped in white cotton candy. It was a little tricky to eat unless you popped the whole thing into your mouth. Yum – such sweet delight. 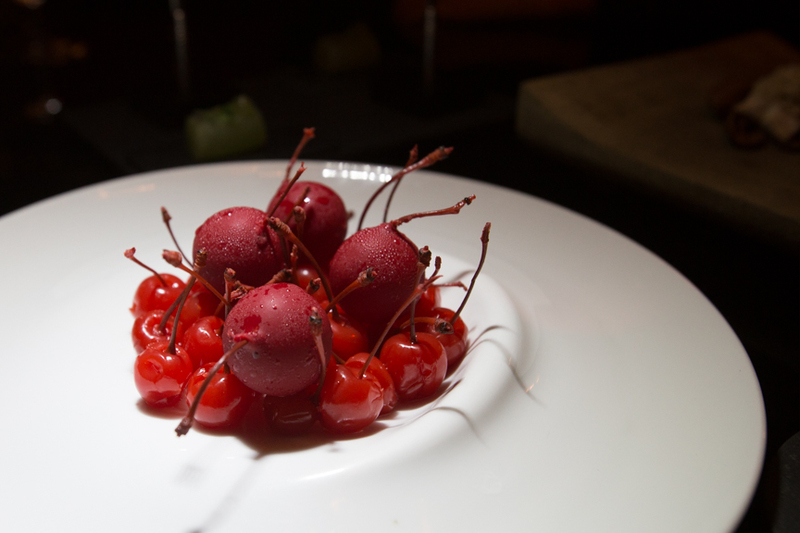 The Cherry Campari dish looked dramatic: a white plate bursting with ruby red maraschino cherries and four large fire-engine red spheres in the center. One bite gave a sensational zing and a taste of campari. Another course: a wooden bowl filled with pecan nuts but four nuts were cleverly disguised. 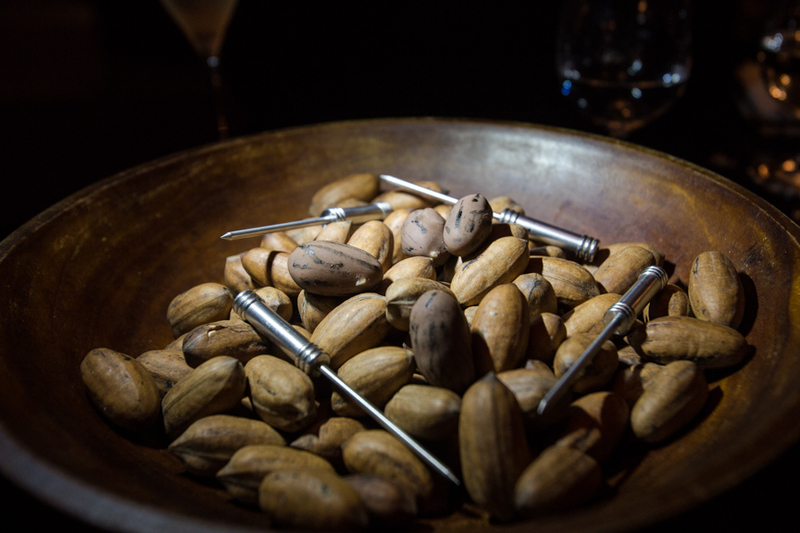 These nuts were made of foie gras. Wow, melt in your mouth decadence. 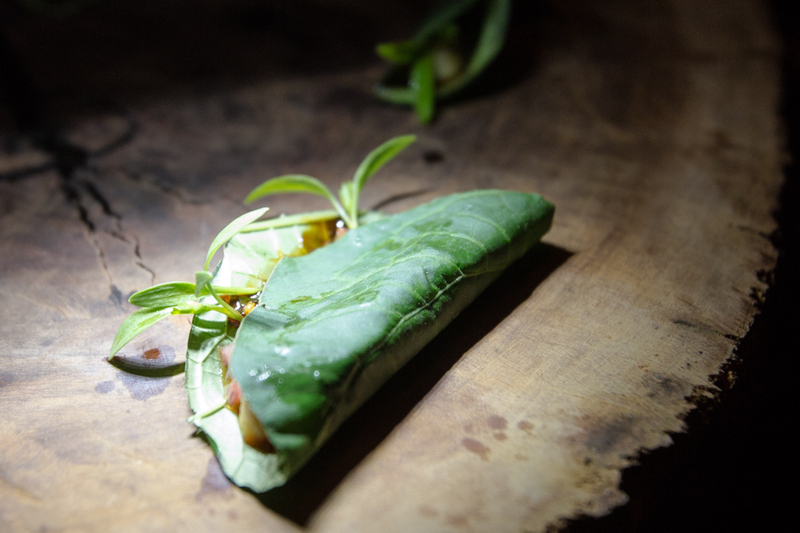 After that… a doll-sized taco appeared; it was wrapped in a green leaf instead of a tortilla shell with baby green shoots sprouting out. I can’t tell you what was inside, but I know I wanted seconds! Excellent spicy taste. Another white bowl appeared with a necklace of flowers and leaves that were all edible. 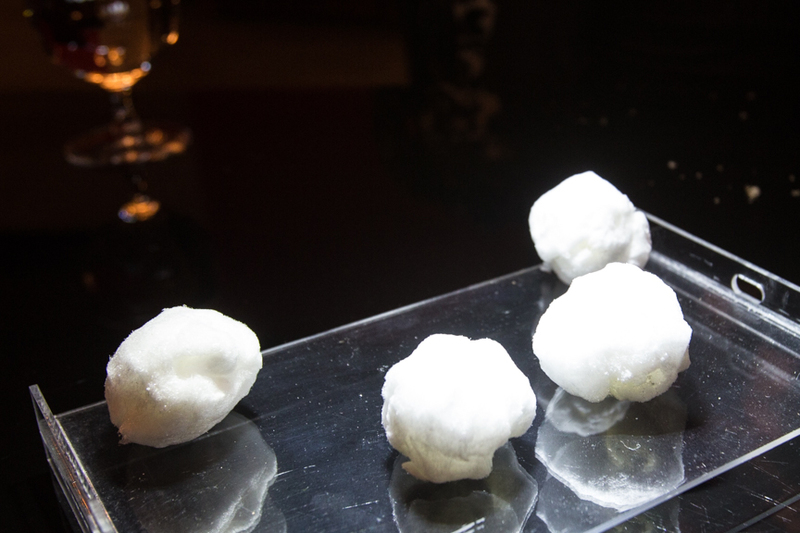 I think this was sorbet and as you can see from the photos – almost too pretty to eat. What next? 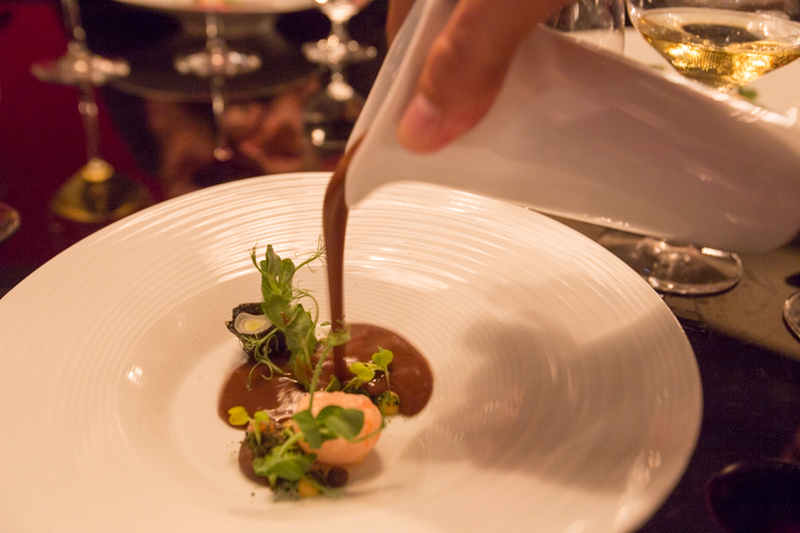 The server placed a bowl with one shrimp and a fern-like leaf garnish down and then poured thick chocolate colored bean soup on top. My spoon became coated in velvety cream with a densely rich beany taste. 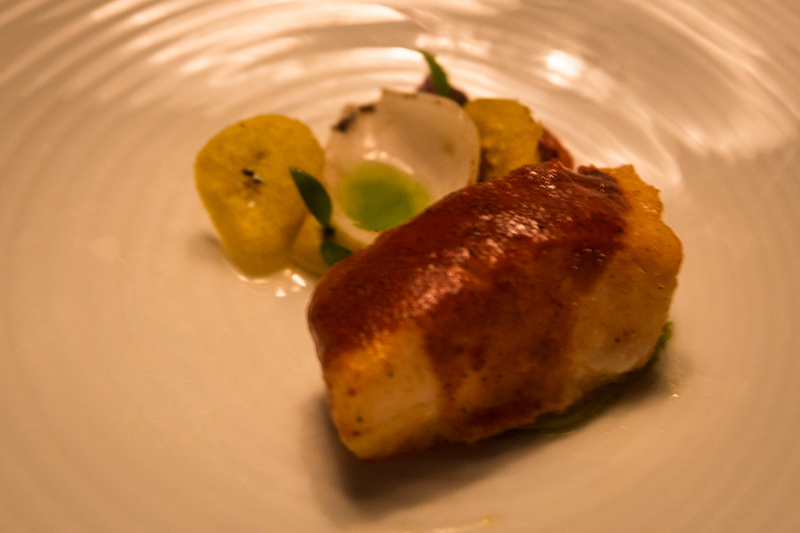 Then came the entree: Chilean Sea Bass, always one of my favorites. The dish was dressed with a side of plantains, but the portions were small. I devoured mine. 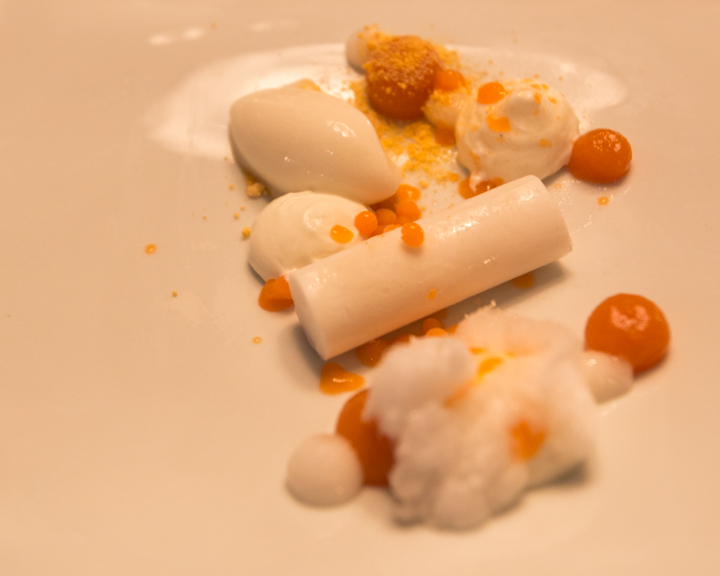 Dessert became a bevy of gifts starting with a winter white dish of small sized candy logs highlighted by caramel dots. I bite into one and believe the candy had a marzipan flavor. 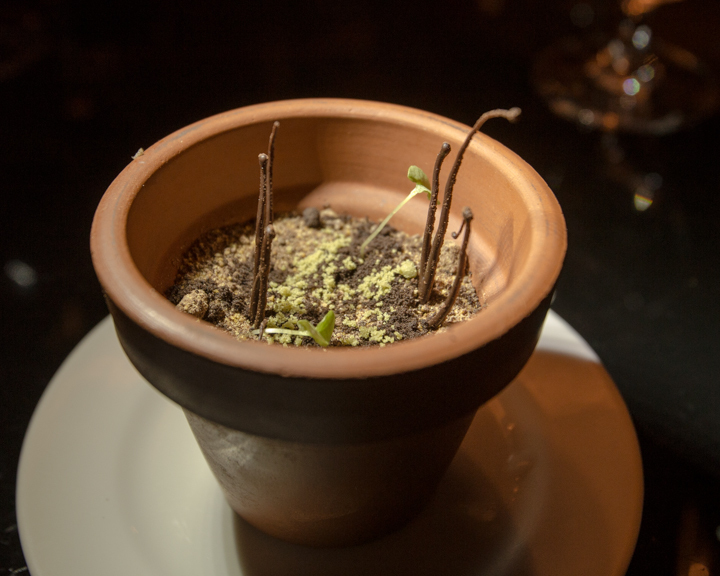 To my surprise, a chocolate flower pot was placed in front of me: an exquisite miniature terracotta pot with flowers that looked like they were growing out of the sandy dirt, which was really cocoa. A spoonful of this tiramisu (my guess) melted on my tongue as I swirled around its divine deliciousness. Lastly a box of various shaped chocolates was delivered to my table, but I’d reached my limit. In addition, who knows how much wine I had been served as the efficient staff kept bringing out bottles and refilling goblets. 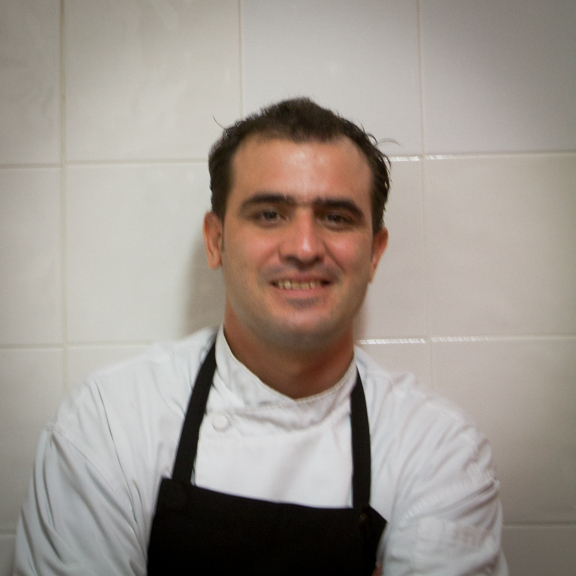 Executive Chef Jonatan Gomez-Luna Torres and his staff outdid themselves with astonishing and creative dishes. Chef explained that he didn’t choose his profession, rather it chose him. He said a good friend took a kitchen job and was overwhelmed with the chores. His friend asked him to help out and Jonatan discovered he loved working with food. The boss told him he was a natural and very good worker. Hence, he stayed with the job and went on to train with some of the best. “It’s my life and there is no other place I’d rather be,” he said. Lucky of us! Chef recently won an “Iron Chef”– styled competition held in Toronto, Canada using black garlic and other authentic Mexican ingredients. 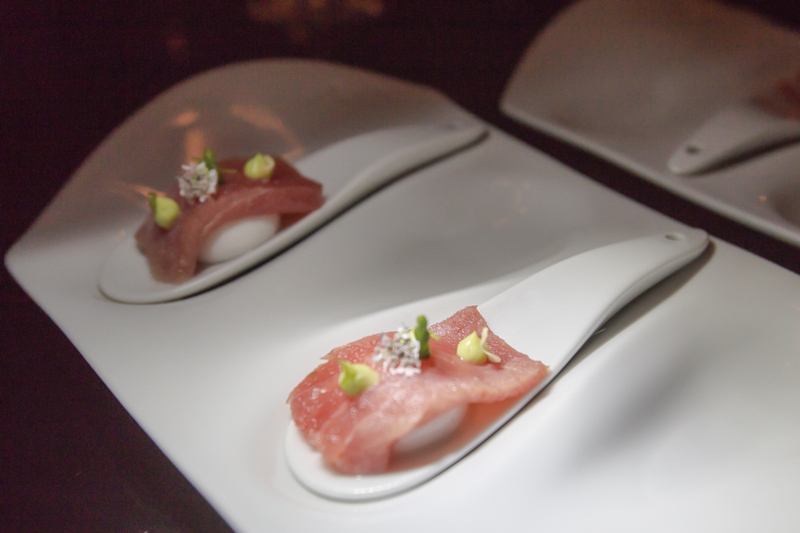 Le Chique recently the honor of being named one of the top five restaurants in Mexico. It was a thrill for me to eat this daring meal in the fine restaurant and I recommend it for anyone looking for a grand adventure. Azul Sensatori is an award-winning Gourmet Inclusive®, 438-suite hotel and resort located just 20 minutes from the Cancun airport. Dinner at Le Chique is included for guests staying within the premium rooms and just $25 extra for other guests. Disclosure: I was flown to Riviera Maya, Mexico for a media trip hosted by Interval International. All Photos by Debi Lander with apologies for the dimly lit shots in the restaurant.